A response to the latest Trump card played – from Paul Northup, Greenbelt’s Creative Director. They turned the lights off on the Christmas Tree in Manger Square in the little town of Bethlehem in the occupied West Bank last night. And our hearts dimmed, too. They dimmed as we remembered all those we have had the privilege of meeting and befriending there over the years as we’ve advocated for equal rights for all people in the land some still call Holy. And as we remembered all the wonderful Palestinian artists and activists we had at the festival this summer. And as we thought of our sister festival, Bet Lahem Live. Donald Trump’s reckless and feckless pronouncement about Jerusalem as the capital solely of Israel and his determination to move the US Embassy back to the city ends decades of America being seen as the potential “honest broker” between the Palestinians and the Israelis. But perhaps his extremist stance might even be helpful – because it is so outrageously and inappropriately honest – in the long run. Still, as the might and machismo of Washington pronounces on the fate of millions of Palestinians – already without a viable state and now (if Trump is to be believed) without a viable capital, too – we remember that the hope that was born in Bethlehem all those years ago took human form. And in human form, Jesus rode to meet the occupying power and might of his day, in peace, and riding on a donkey. In so doing, he created an enduring and transforming narrative that many of us still try to live in the light and example of today. So, to all the Palestinians – occupied, shut in, walled off, held and humiliated at check-points, appealing against the loss of your land, longing to return to the villages your ancestors lived in for centuries, denied your basic human rights – we stand with you. We British and the international community more widely have shunned you too long. But your story is still being born. And its power and potential will upturn the current status quo one day. Just as the person called Jesus Christ of Nazareth did and still does today. We will not forget you. And to all the many, many Israelis who think that occupation and Trump’s pronouncement is bonkers, we salute you too. Those like Sahar Vardi, Marc Ellis, Mark Braverman, Robert Cohen, and Jeff Halper. So many we have had the privilege of hearing at the festival over the years – and the thousands upon thousands of peaceful activists who stand behind you in Israel and around the world, mourning the way in which their nation is becoming a pariah State. Trump’s endorsement yesterday only served to underline the increasing apartheid of Israel in its behaviour and its deliberate choking of the two-state solution as a viable option. The world, it seems, is teetering back towards a new isolationism – through Brexit, Trump’s “America first”, North Korea’s nuclear antics, Israel’s continued occupation and flouting of international law – and so much more. But this Christmas, we are reminded of the life of the baby born in occupied Judea all those centuries ago; we remember that hope and dignity are borderless values and the right of everyone. And you know what they say? The darkest hour … comes just before the dawn. Pictured: Looking out over the old town of Bethlehem, March 2017. You can hear a wonderful Palestinian community leader here in the UK right now! 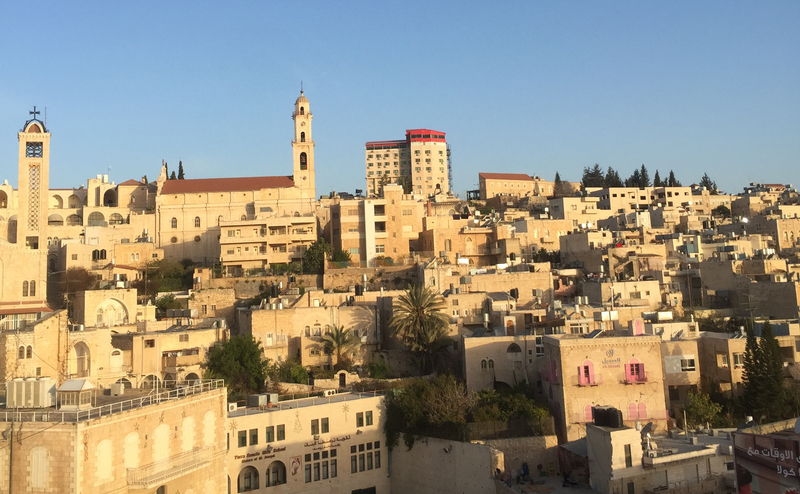 Thanks to our friends at Amos Trust, Sami Awad of Holy Land trust is speaking in Canterbury tonight and Bristol on Saturday.